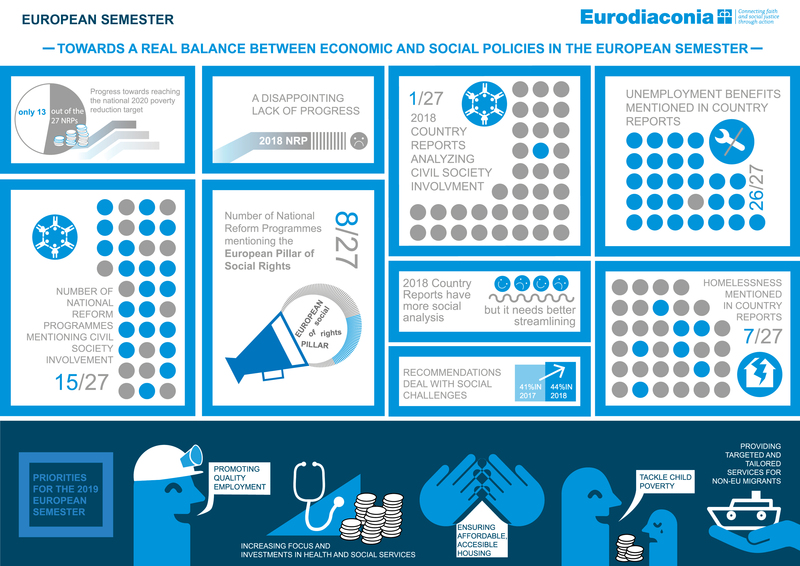 On 16 October, Eurodiaconia published a report taking stock of the 2018 Semester cycle and giving the priorities for the 2019 European Semester. This report, entitled Promoting shared prosperity in the European Semester, accompanies and supports Eurodiaconia’s input to two key documents of the upcoming Autumn package, namely the Joint Employment report and the Annual Growth Survey. The two letters aim at influencing the drafting of these key Semester outputs by highlighting social policy priorities. The JER letter details the first priority on promoting quality employment whilst the AGS letter underlines all five policy priorities. 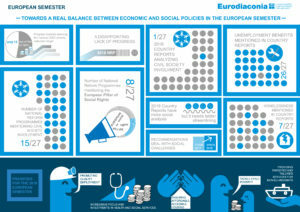 Eurodiaconia’s priorities are derived from our policy work and from the challenges highlighted by our national members. They aim at promoting shared prosperity in the sense that the proposed reforms and orientations allow for the gains of growth to benefit all and increase the fairness in our societies, thereby promoting economic and social improvements. This is particularly needed at a time where citizens increasingly question the European project. Rebalancing European policies to ensure the promotion not only of economic growth but also of social inclusion and fairness is therefore key to make sure that no one is left aside. increase the focus on health and social services to adapt to the ageing of European societies. To know more about our recommendations, check our latest publication on the Semester.